Hai friends on this occasion I will tell you about "Advantages and disadvantages Razer Gaming Phone". Well, surely you already know the big gadget gaming Razer logo is, releasing the Razer Razer Phone some time ago. If you want to know the review about Razer Phone this then here is the SPECIFICATION along with its advantages and disadvantages Razer Phone gaming. RAM specs on Razer Phone has been very high since his RAM's "8 GB ". It is definitely with RAM for this we can run many applications simultaneously without any crashes. You can use the Razer Phone to open many applications at the same time with the large RAM spool you can open applications WA, FB, and other Browsers at the same time. Razer Phone chipset specifications already high because it can chipset this "Snapdragon chipset 835 ". Very epic to play games heavy on Android in this Phone with a spec like this tripe you can spy out of stock android game is great though. 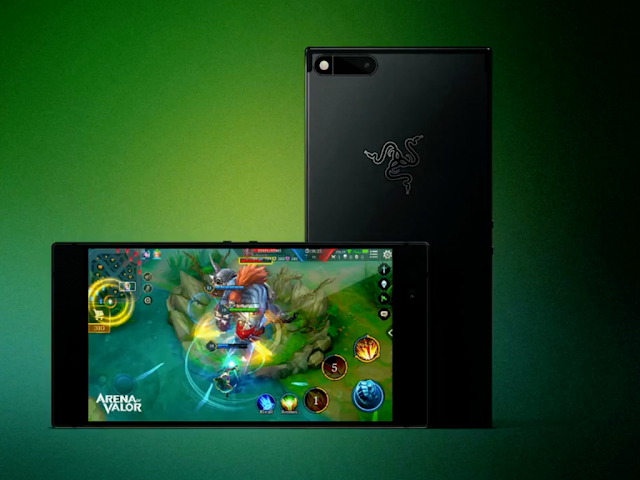 Specifications of Razer Phone Screen with the already high specification of "5.7-inch QHD IGZO LCD and refresh rate 120 ". You guys would be comfortable using it to play games. If you people who like to show off then buy lah Razer Phone, because on this Razer Phone you guys can show off its cool it on friends you can cause them pain the arse (if you want). The camera on this Phone is not nice Razer where features are less good when doing a capture on video when you guys take pictures of moving quicker than the object will be opaque. On the iPhone, this feature already exists to take pictures even better while doing video capture him not blurry when moving objects quickly. Yes, how is not expensive for the Razer Phone this is Price's "10 million ". Is enough to make our pockets empty or even make us have debt Yes. Therefore if you people who just plain don't have to buy it, unless you guys son sultan, officials, child corruptor and such. Normally for laptops only have additional features such as the skin and the other software that exists only in the razer. Well at Phone is very minimal even launcher the default android like Phone. For you guys who like Razer Phone then look razer in Phone is very minimal yes most only when BOOTING and other processes that would have been very little. The outskirts of Razer Phone this did not blunt, therefore to holding it up to the edge of discomfort. Therefore you must purchase additional chasing to overcome this. You already know how that Razer Phone right, back on again if you guys want to buy it because I just did a review of it. To buy Razer Phone it doesn't expect the Phone store at all because to buy Razer Phone this you had to buy it online. Well, that is the content of this article, i.e., "Advantages and disadvantages of Razer Gaming Phone". Yup, so this article may help you guys "provide information before you buy a Razer Phone " also do not forget to share and comment below Yes.